Altruism – Patrick F. Clarkin, Ph.D.
As a college professor, I have some “radical” opinions. For one, I would like to see war and suffering decrease in my lifetime, if not my kids’ lifetimes. I am confident that while war may sometimes be necessary, it does more harm than good, and I am also confident that those negative effects can last for generations. At the same time, I also value truth very much, and I try to avoid naïve interpretations of human biology and behavior. Instead, I try to take a nuanced view when it comes to things like the roots of war, nature/ nurture, and even human sexuality. With all of that said, I’m going to try to splice together a few recent threads to find some reasons for optimism, despite the way current events seem to be going around the world. Things are certainly not great. By the end of 2016, an estimated 65.6 million people had been forcibly displaced by conflict, the highest number ever recorded. The UN High Commissioner for Refugees Filippo Grandi lamented that “the world seems to have become unable to make peace.” Partly as a result of conflict, 20 million people are at risk for starvation in four countries: Yemen, South Sudan, Somalia and northeast Nigeria. By comparison, battle casualties per capita have generally decreased since 1946. 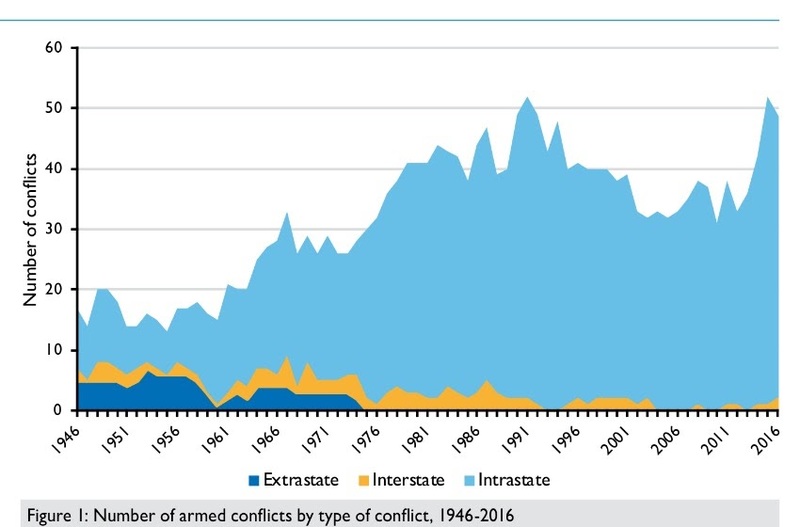 While the number of conflicts have gone up, they have been primarily intrastate ones, and smaller in scale. A word of caution, however: “battle casualties” is a metric that looks at violent deaths only. It does not include indirect deaths due to things like broken infrastructure, such as lack of electricity, food/water, and health care that accompany war. If those numbers were included, the number of deaths surely would be higher. And, while the number of conflicts is a tally, battle deaths per capita is a rate, so the two aren’t directly comparable. The total number of deaths might present a different perspective, as might the rate per capita of people who were forcibly displaced. I’ve been thinking of how people are quick to demonize one another, at a time when social divisions are rising in the United States and elsewhere around the world (or what I imperfectly perceive as rising divisions). The phenomenon of Us and Them is ever-present. For a long time people have recognized the pattern that we tend to demonize others who are different from us. This blog has been an exercise in sharing some knowledge — and I do try to get things right — but it’s also been an attempt to try to seek out overlooked pieces of optimism. My biases creep in, and I know they are there, but they are mine and I own them. I can see the nastier side of human beings clearly, but I know there is more to us than that. We can’t ignore those things either. I see humans as evolved, fallible creatures (just like every other species). At least for me, it helps to remember that we are all a single species, that we are all related, that we are obligatorily social and require some degree of connection, that we can overcome difficult circumstances, that people can break cyclical violence, that the universe favors non-zero sum relationships to some degree, that nature is not always red in tooth and claw, that we are flexible and just as predisposed for cooperation as we are for conflict, that we can find ways to reconcile and mend broken relationships, that life is beautiful, and, finally, that we are more alike, my friends, than we are unalike. The Dalai Lama wrote this soon after September 11, 2001. I think it cuts across all faiths and religious traditions. “Today the human soul asks the question: what can I do to preserve the beauty and the wonder of our world and to eliminate the anger and hatred — and the disparity that inevitably causes it — in that part of the world which I touch?